Jeremy Danner started at Boulevard back in 2008 as a full time brewer and spent a few years being the brewing face of the brewery, developing the skills that developed into his current role, since 2013 as Boulevard’s Ambassador Brewer. Having never homebrewed Jeremy made his first batch of beer professionally in 2006 in a neighborhood brew pub where he bartended. He brewed 7 barrels and hasn’t looked back since. – Brewed the Easy Way? only 48 bottle It’s a “screw” you to AB – next week 20 a bottle that will go to Kalamazoo River Valley Trail. Thanks to Craft Beverage Jobs for being our sponsor. And a big Thank You to Jeremy Danner of Boulevard Brewing for spending some time with us. And Craft Beer Nation will be at Savor this year. We’re looking forward to seeing you there! 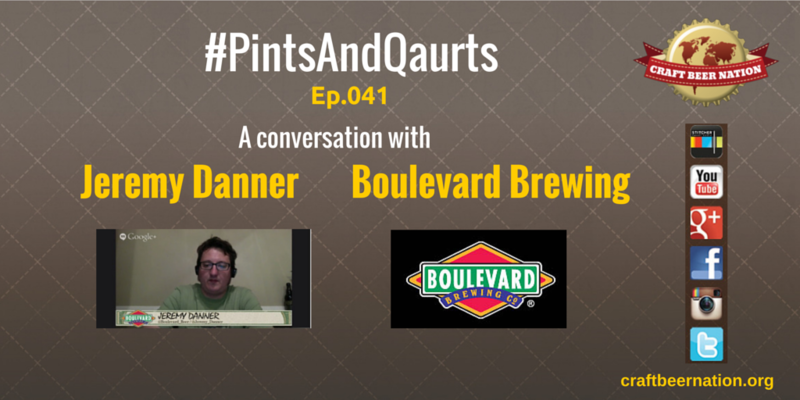 Filed Under Beer News, Pints and Quarts, Podcast, YouTube | Tagged craft beer, pints and quarts. Bookmark the permalink.